For more than a decade we – photographer Jason Orton and writer Ken Worpole – have documented the changing landscape and coastline of Essex and East Anglia, particularly its estuaries, islands and urban edgelands. We continue to explore many aspects of contemporary landscape topography, architecture and aesthetics, and in 2013 published our second book, The New English Landscape (Field Station | London, 2013), the second edition of which was published in 2015 and is now out of print. 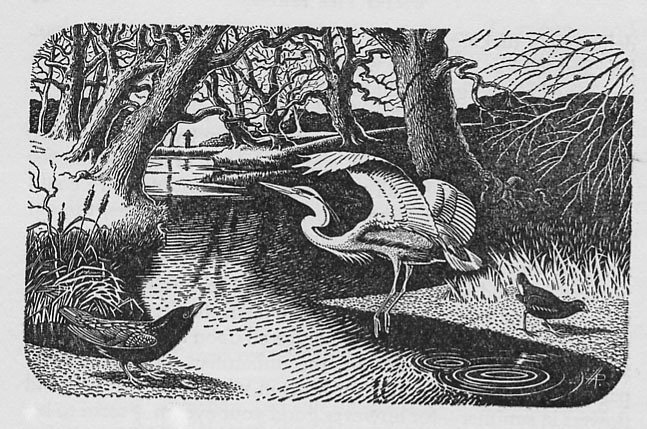 Just as J.A.Baker achieved posthumous fame for his exquisite writings about the natural landscape and avian life of the River Chelmer and the Blackwater Estuary – notably in The Peregrine – it is timely to remember another Essex naturalist and writer, D.W.Gillingham, rather less well known today but equally alert to the Essex landscape. Born in Walthamstow in 1906, after moving with his family to Canada in 1911, Gillingham returned to settle in Loughton in 1934, where he lived at 28 Roding Road until his death in 1965. Read Unto the Fields with the OS map close to hand and it is astonishing how much Gillingham observed and recorded in such a tiny area on between Epping Forest and the Roding Meadows. His early morning, late night and weekend walks never took him more than four miles from home, mostly between Chigwell Lane and Warren Hill, but in these ‘intimate nooks and corners’ he saw otters, deer, stoats, foxes, redshanks, snipe, lapwings, owls, herons, nightingales, dozens of different finches and song-birds, many becoming familiars, their habitat and routines ecstatically noted and loved. ‘Find me a fairer spot in Essex!’ he wrote of a walk close to Chigwell Lane, before going on to admit that there were as many other such places in the county as there were people to cherish them. Gillingham’s life appears to have been one of extremes. After his parents emigrated to Vancouver he attended the University of British Columbia, subsequently travelling to the Arctic Circle with fur traders, while writing short stories, at least one of which was published in the prestigious literary journal, The Dial. At some point in his early life he trained as a pilot. By the 1930s, back in Loughton – like J.A.Baker – he worked in an office (‘uncongenial work’), escaping from the ‘arid plain of failure’ to cycle everywhere on his early morning or night-time forays into the nearby fields and forests. Even so, when war broke out he spent two years with a Night Fighter Squad, before being posted to the Middle East. After the war he became a familiar figure locally, his obituary in the local newspaper recording that, ‘His many friends will remember him best for his shapeless beret, stout walking shoes and amiable booming, cultured voice.’ In his last years Gillingham worked as a private gardener. 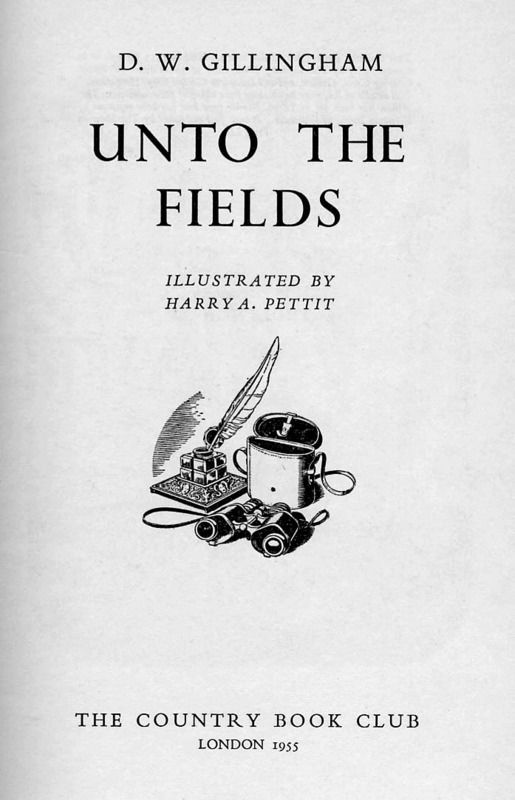 Unto the Fields is worth searching out, the early editions beautifully illustrated by Harry A.Pettit, a book illustrator whose work continues to be admired. 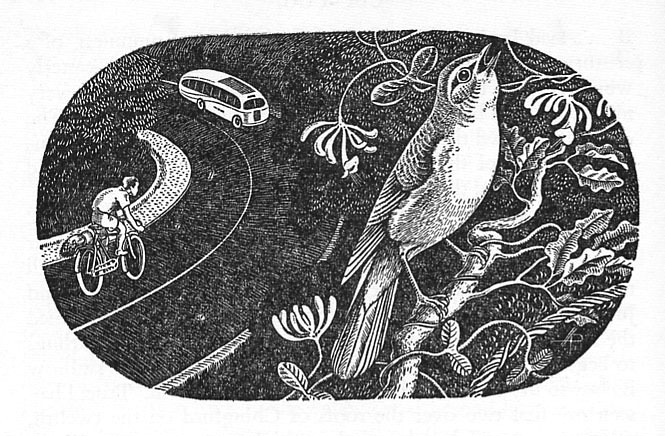 In the published writings of both Gillingham and Baker, there is little mention of work, of domestic life or other interests – just an obsessive empathy with birds, and their migrations, nestings, feeding patterns and interaction with the rest of the natural world. From such patient observations, the modern reader is given access to a myriad of small worlds then to be found in suburban lanes and along the banks of the smallest Essex creeks and rivers. In Gillingham’s case, his notebooks recorded Loughton before the arrival of a wartime barrage balloon station and, subsequently, a new housing estate, close by. Gillingham’s description of his adopted territory, recalls those wonderful passages in the early novels of D.H.Lawrence when that writer rhapsodised about the walks he made from his terraced street of miners’ cottages in Eastwood to the nearby farms and woodlands. This post is based on a talk to the Loughton Historical Society on 13 November 2014. Thanks are due to Jan Kinrade for additional biographical information about Gillingham.